During a special Inside Xbox broadcast hosted at the beautiful Goodwood Estate in Chichester, England, Microsoft and Playground Games detailed the post-launch roadmap for Forza Horizon 4, revealing the types of content and new experiences we can look forward to over the next few weeks and beyond. Whilst launch is undoubtedly a significant milestone for the game, the team at Playground is committed to updating Forza Horizon 4 with new features, content and experiences. This will coincide with the weekly seasonal changes in the game, allowing you to always have something new to discover and play in beautiful, historic Britain. The fun begins immediately at launch, and if you’re a Car Pass member, you’ll have the added benefit of receiving two new cars each week over a 21-week period – added to a combined total of 42 brand-new vehicles to discover, and that doesn’t even include all the free exclusive cars that are coming to the game as well. Firstly, there’s the Horizon Summer Season, which coincides with the early access release of Forza Horizon 4 for Ultimate Edition owners on September 28th. 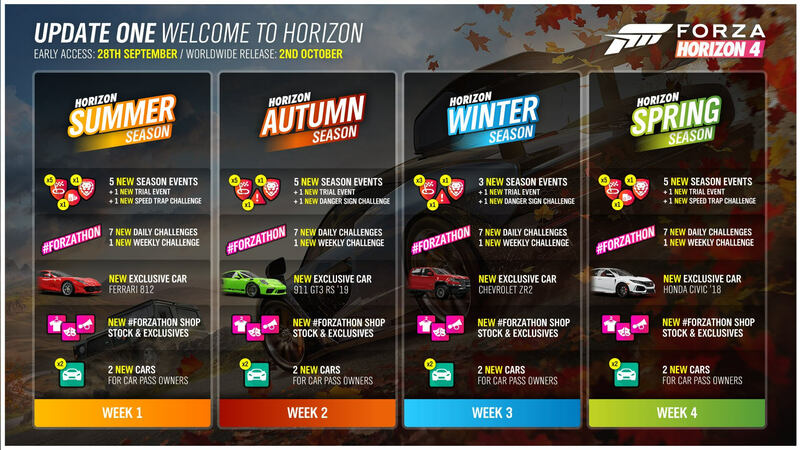 This will be the first official weekly season of the Horizon Life, and it brings five exclusive seasonal events, one unique trial event – a lengthy online cooperative race, as well as a one-off Speed Trap challenge. As for Forzathon, there’s seven new daily challenges and one new weekly challenge, with the Forzathon Shop offering the 2018 Ferrari 812 Superfast as an exclusive car, alongside a host of other unique items. Car Pass holders can also look forward to two new cars in the 2017 Koenigsegg Agera RS and the 1962 Triumph TR3B – available to collect, race and customize at launch. The Horizon Autumn Season follows this with even more new seasonal events and Forzathon challenges to discover, with the 2019 Porsche 911 GT3 RS being the latest exclusive car available from the Forzathon Shop. Car Pass members can also look forward to the 2018 Nissan Sentra Nismo and the 2002 Mazda RX-7 Spirit R Type-A. The Horizon Winter Season introduces 3 new seasonal events and even more Forzathon challenges to dive into, with the Chevrolet ZR2 truck being added as another exclusive car available to acquire from the Forzathon Shop. Car Pass members will also be able to enjoy the 1985 Porsche 959 Prodrive Rally truck and the classic 1959 Porsche 356A Super Speedster. Finally, the Horizon Spring Season will introduce five new seasonal events with eight more Forzathon challenges to beat. The exclusive car to acquire this time will be the 2018 Honda Civic, whilst Car Pass holders can look forward to the 2018 BMW i8 Roadster and the 2016 Honda Civic Coupe GRC. Overall, there’s a ton of content to look forward to with each seasonal change, and some of the exclusive seasonal events over the next few weeks are also themed around the iconic James Bond movies and the vehicles included within the Best of Bond Car Pack. However, the fun doesn’t stop there because the first major game update for Forza Horizon 4 arrives on Thursday, October 25th – almost a full month after release. The headline feature in this one is undoubtedly the Route Creator, which will allow aspiring players to create and share their own custom race routes. There’s also a new Horizon Story titled ‘British Racing Green.’ This one will allow you to get behind the wheel of some of Britain’s most beloved cars as you produce episodes of a brand-new motoring TV show for the Horizon Festival. 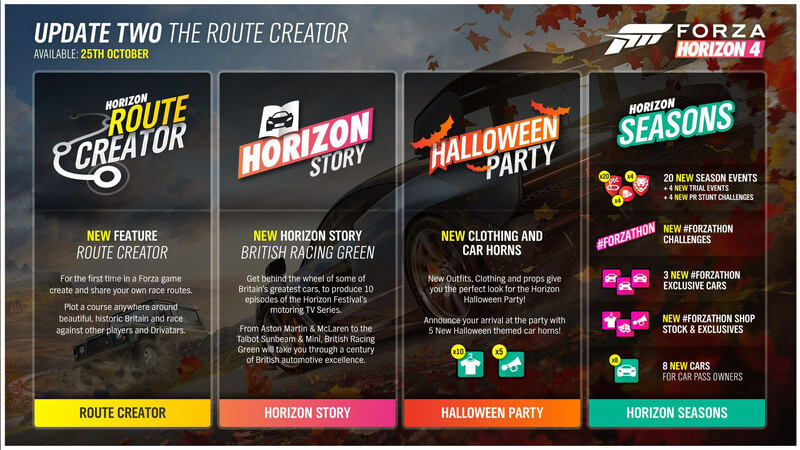 Forza Horizon 4 will also celebrate a Halloween Party with new clothing and car horns. You’ll be able to personalize your character to mark the occasion with ten new outfits, clothes and props, as well as five spooky-themed horns. Over the course of the four seasons following the October update, you can look forward to 20 new seasonal events, including four new trials and four new PR Stunts, as well as several new Forzathon challenges, three new exclusive cars, new items from the Forzathon Shop, and eight new cars for Car Pass holders. It’s sure to be a lot of fun! You can check out the full Forza Horizon 4 post-release segment from the latest episode of Inside Xbox above. 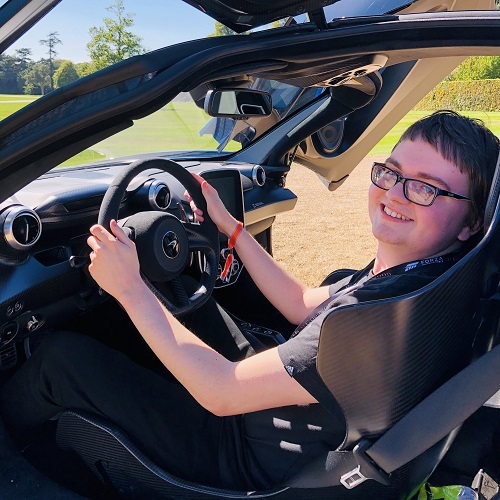 Otherwise, be sure to read our in-depth review for the game, which says “Forza Horizon 4 is the culmination of several arcade racing experiences fused into the definitive automotive open-world package, ready to be explored, raced and shared.” As a reminder, Forza Horizon 4 will be available from October 2nd, 2018 on Xbox One and Windows 10 PC, as well as the Xbox Game Pass subscription service, whilst Ultimate Edition owners can start playing four days early from September 28th. This is it, the Horizon Festival has officially arrived in beautiful, historic Britain.